If your phone is not charging, the first thing you should check is that your cable and adapter are working well. Please check the following things to determine if the issue is with the phone or charger. 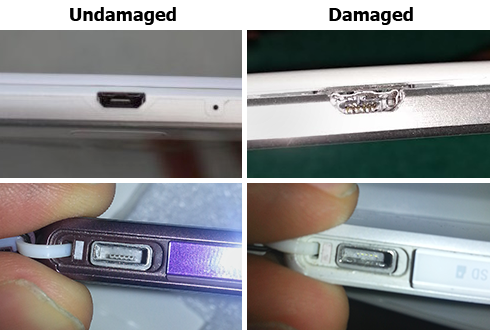 You can see examples of damaged and undamaged charging ports here. Gently clean any dirt, dust or debris from the port as this may be causing an insufficient connection. If after all this has been checked and there is no damage to, or dirt and debris in the charge port, and the charger seems to be working well, it is possible that the issue is related to the phone. Please let the phone sit on charge for at least an hour before attempting to turn it on. If you have a Kogan Agora phone, please note that this series requires 'trickle charging' when the battery is completely flat. This means that the devices do not store a battery reserve, and as such, they require an initial charging period of up to three hours before they can be powered on to be charged to full. It may appear that the phone is not charging when completely flat, as it does require this trickle charging period before the screen can be powered on. Please also carefully inspect the screen for any sign of cracks or damage including beneath the glass, and this can cause the screen not to display anything and can appear like the unit is not charging or turning on. If you are still experiencing some issues with charging your phone, please contact our Support Team via your Kogan.com account and let them know what troubleshooting steps you have already tried. Why isn’t my phone turning on? Power cycles can fix many minor issues with phones. How do I perform one?